Michael Wardell shares his online portfolio. 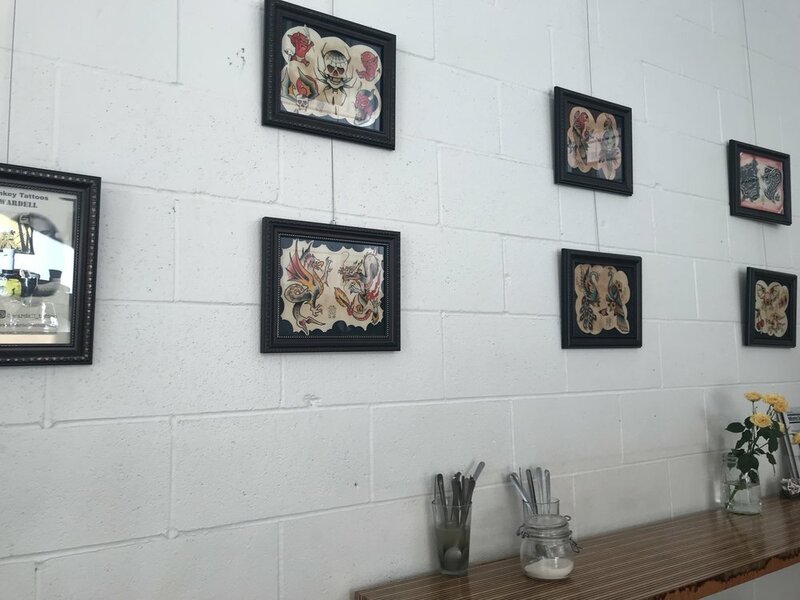 Mike specializes in neo-traditional color work but also enjoys a variety of other tattoo styles including black and grey, traditional, and geometric design. Through the month of February, my art will be on display at Bar Francis in downtown Olympia. The display showcases several of my hand-painted designs, primarily influenced by the American traditional style. A few of my hand-painted flash designs currently on display at Bar Francis. American traditional, a style which features bold, black outlines and a limited color palette, emerged in the late nineteenth- and early twentieth-centuries. 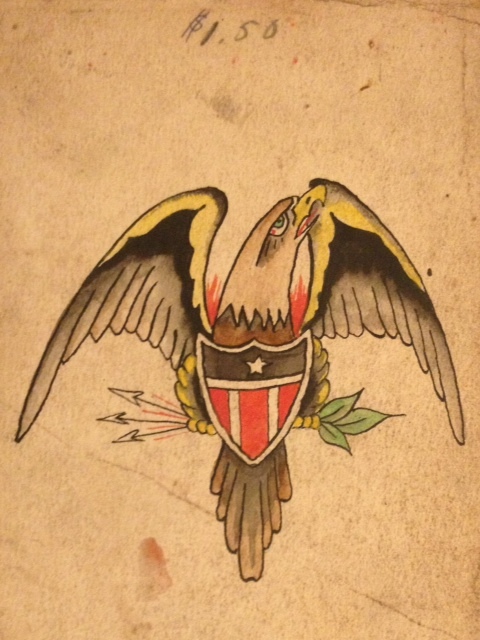 Unlike the custom art often tattooed today, American traditional was predesigned as tattoo flash featuring patriotic imagery, such as bald eagles and the American Flag, as well as pinup girls, ships, daggers, hearts, snakes, pigs, roosters, roses, and swallows. These images, designed to last for years to come, appealed to potential customers through bright colors and bold imagery. Although tattoos were briefly seen as a mark of bourgeois fashion in Europe, tattooing was adopted in America as a blue-collar fascination. Many early tattoo enthusiasts were US Military personnel, especially sailors coming home from or going to war. Flash designs offered a sense of individuality to these men, whose occupation dictated conformity. 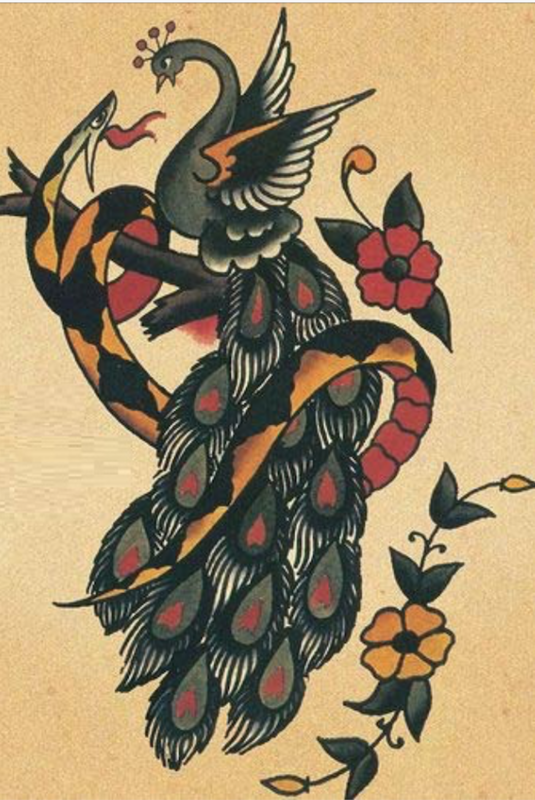 Thus, many of the American traditional designs serve as a reminder of what it means to be human. Images of hearts, flowers, daggers, reapers, eagles, and shields reflect values such as love, death, honor, and mortality. The pieces I’ve included in the show represent a study in American traditional tattooing. I painted these pieces to examine why I’ve been attracted to the traditional tattoo style and to explore what I could do with a limited color palette: red, orange, yellow, green, blue, and black. While my work includes traditional imagery such as dragons, daggers, dice, cherries, and parrots, the paintings on display also illustrate my personal style. I hope that you will make your way down to Bar Francis this month and check it out and, once you do, leave a comment below or hit me up on Instagram (@mikewardelltattoo) to let me know what you think. My art show, currently on display at Bar Francis located at 110 Franklin St. in downtown Olympia.